This guide shows tips on tree planting and care. Best practices for tree planting and care evolve over time as more is learned through research. The best time to plant a tree is during the dormant season in the fall after leaf drop but before winter or in early spring before bud break. While trees can be planted in the summer, they require more irrigation and their energy goes into new top growth at the expense of establishing roots. Consider the site. If planting a street tree, select one from the Alamosa Tree Board Recommended list . Make sure there is room for tree to reach adult size. The Community Tree Alliance recommends using smaller trees for earlier establishment, lower maintenance of the tree over time, and to minimize investment risk. Decide how deep to plant the tree. A common mistake is to plant the tree too deeply. Most of the important fine absorbing roots will develop in the upper 12 inches of the soil. Trees should be planted so that the top of the root ball is 1-2” above the surrounding grade. This helps tree roots get the oxygen that is essential to plant growth. If the tree is burlapped or in a container, measure the height and width and dig the hole to a depth slightly less than the height of the root ball, but two to three times as wide. If the tree is bare root stock, dig a hole wide enough to spread out the roots, but just deep enough to cover the roots. 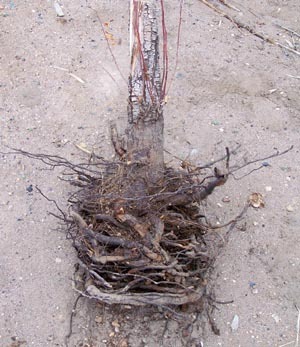 Lift or move the tree by the root ball, not the trunk, to avoid damage to the tree. Before backfilling the hole, make sure the tree is straight. Burlapped trees: If there is a wire basket remove the top tiers by cutting away to allow roots to spread. Remove any string around the trunk or stem. Container trees: Carefully remove tree from container if possible. If not, cut container away. Gently loosen any spiraling or circling roots. Bare root stock: Carefully spread out the roots. Typically, no more than two inches of soil should be placed on top of the roots. Girdling roots (those that grow in a circle around the inside of a container) are a major reason trees die within eight years of planting. Once they've started growing in a circular manner, they continue to do so eventually choking the tree to death. Disrupt the circling roots by making several vertical cuts on the outside of the root ball or by loosening the outside roots with your hands. I dug it up. It literally choked to death. Backfill the hole with the native soil unless the soil is undesirable. Gently push soil around the roots and water to eliminate air pockets. Do not pack the soil after you water. Thoroughly water newly planted tree. Generally, fertilizing newly planted trees is not recommended. It takes energy for a tree to absorb the fertilizer and the energy is better used for establishing new roots. Protect the newly planted tree from damage by such threats as deer and lawnmowers. Many people in Alamosa are now surrounding tree trunks with chicken wire or some other material that prevents deer from grazing on the trunk and damage from lawnmowers or trimmers. Staking: Generally, stacking is not required. However, it may be necessary in very windy locations. Soil amendments/fertilizer: As trees mature, consider the tree’s need for nutrients. Fertilizing a tree can improve growth; however, if fertilizer is not applied wisely, it may not benefit the tree at all and may even adversely affect the tree. Mature trees making satisfactory growth may not require fertilization. Mulch: Maintain mulch layer of 2-4 inches.